The 2018 Dell XPS 15 is all about bringing the power of Intel 8th-generation H series and Core i9 processors to a laptop as thin as the best Ultrabooks. In that respect, Dell completely delivers, enabling specifications with serious power available in a thin and light, 14-inch laptop frame. Obviously, that frame hosts a 15.6 inch InfinityEdge touch display with bezels so thin you’ll forget they’re even there – and at a price that will make Apple pause. While we’re holding our judgement until a full review, things look amazing for Dell’s supersized XPS laptop of 2018. Dell has started selling the new XPS 15 at a decent price of $999 (about £949, AU$1,299). That starting price includes an 8th-generation Intel Core i5-8300H Kaby Lake Refresh CPU that runs up to 4.0GHz, along with an Nvidia GeForce GTX 1050 GPU with 4GB of GDDR5 VRAM. Those both power a 15.6-inch FHD (1,920 x 1,080) InfinityEdge display that’s just around 14 inches wide. The anti-glare screen meets 100% sRGB, sports a 1,200:1 contrast ratio, shines at 400 nits, has IPS for 178-degree wide viewing angles. This display can be upgraded to a 4K Ultra HD (3,840 x 2,160) InfinityEdge touch display with a juiced up contrast ratio. Likewise, the graphics can be upgraded to GTX 1050 Ti, and the processor to an Intel Core i7-8750H at 4.1GHz or even an Intel Core i9 CPU, to keep pace with that sharper display. As far as memory and storage goes, the XPS 15 comes with 8GB of DDR4 RAM to start and can be upgraded to 32GB, meanwhile starting storage comes in at a 128GB SSD + 1TB HDD. Beyond that, you can upgrade to a 256GB PCIe NVMe SSD, 1TB solid state hybrid drive, 512GB PCIe NVMe SSD or a 1TB PCIe NVMe SSD. By design, the XPS 15 looks simply like a blown-up version of the 2017 Dell XPS 13, ‘Chin Cam’ and all. Of course, that includes a brushed aluminum lid and base that surround a soft-touch carbon fiber keyboard deck. That keyboard deck feels as plush as usual and houses the same Dell keyboard you’ve come to love, so expect deep enough travel and strong feedback. The display, whether in 1080p or 4K, looks fantastically sharp and bright and is nearly bezel-less. 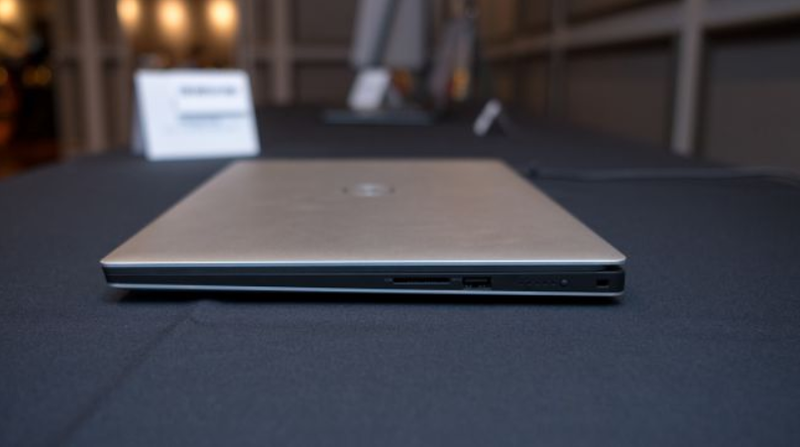 Of course, this has driven the webcam into Dell’s now-classic ‘Chin Cam’ position – not that rivals like Huawei MateBook X Pro have done much better. All told, the XPS 15 accomplishes quite a lot for a laptop that’s just 0.66 inches (17mm) thick and weighs just 4 pounds (1.8kg). We anticipate that the available processor options will allow this laptop to gobble all basic computing tasks up for breakfast. That said, we don’t expect Core i9 to entice the XPS 15 core audience. Rather data crunchers and extreme Excel users might find the most use out of the hexa-core CPU. 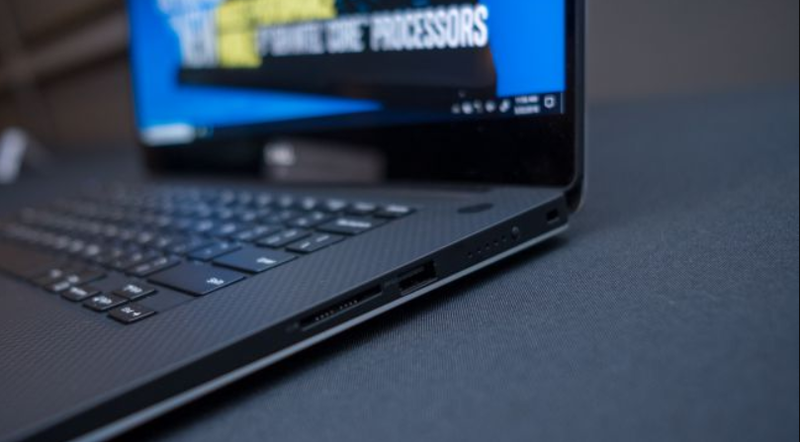 Given the high-premium the Intel Core i9 chip places on other laptops like the MSI GT75 Titan, we can expect the highest end version of the Dell XPS 15 to be as equally as expensive. That said, Dell promises a battery life goal of 21 and a half hours with the XPS 15. Perhaps that’s possible with the 1080p model, but we’ll believe it when we see it. At any rate, it’s easy to expect some pretty impressive performance even from the entry-level XPS 15, especially for the price to start. 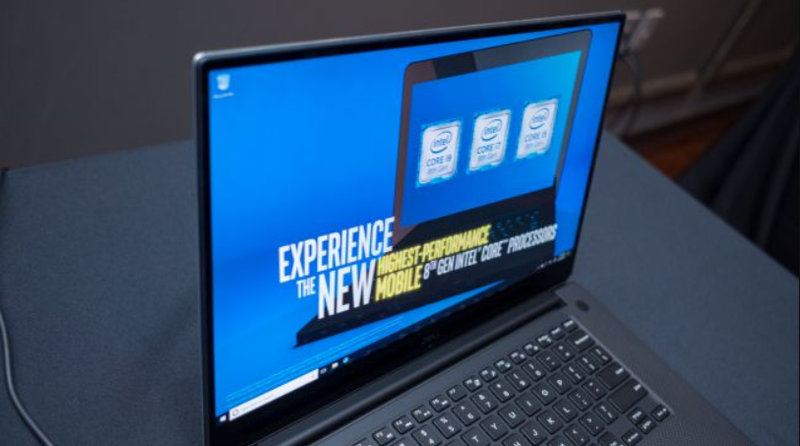 The new-and-improved Dell XPS 15 really takes the performance factor to the next level with Intel’s latest H series processors and Core i9 mega-tasking capability paired with strong Nvidia graphics. Even at its starting price, you’re looking at quite the rival to Apple’s 15-inch MacBook Pro. For the money, the XPS 15 looks like it’s going to turn quite a few heads when it lands this May in stores and online. Stay tuned for our review to see whether those parts hold up, especially regarding that massive claim to battery life.